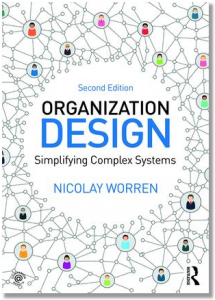 A seemingly small change in the formal structure of an organization may greatly simplify – or complicate – the way we work. The problem is that when we move boxes on the organization chart, we don’t easily see how a formal regrouping will affect the work processes – because they are in the “white space” between the boxes. In particular, a change in the formal structure can lead to a sharp increase in the number of interfaces between units – which in turn leads to an increase in coordination costs. Yes, you may say, but isn’t it good that people coordinate with each other? You may certainly want people to coordinate across units – and to “collaborate” on certain initiatives. But you probably don’t want your people to have to send 15 emails or conduct 15 meetings every time they need to do something – IF it could have been accomplished with 1 email or 1 meeting. But that is the consequence of getting the structure wrong. In the video, I discuss this challenge (the video lasts for about 6 minutes). I use some slides that show the formal structure of a hypothetical firm with three divisions – each responsible for one product. The key issue I discuss is whether the firm needs to organize itself in a uniform way – that is, whether each of the three divisions needs to adopt the same formal structure. If one division (business area) chooses to organize itself differently from the others, does that have a positive, negative (or no) impact? It all comes back to the effect that our choice has on the number of interfaces. I’m Organisational Design Analyst in Colombia, actually i work in one of the most big organization my country, we have around 40.000 employes aprox. (In Colombia, Perú, Panamá, El salvador, Puerto Rico and Cayman Islands). Your blogs, documents, and other sources, become very interesting and useful in my day by day work. I have been interested in your work, so i’ll be close and expectant to your sources. Hola Jorge! Thanks for your comment, glad you find the blog useful. Hablaremos!